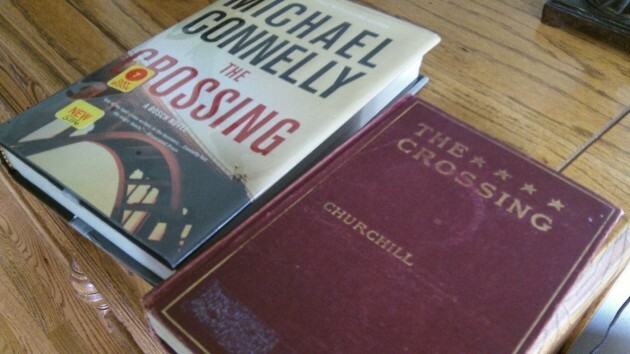 The library sent me an email, and I went downtown to check out the latest Harry Bosch novel by Michael Connelly, “The Crossing.” An hour later, in Browsers’ Books, from low on a shelf of antique tomes way in the back of the store, “The Crossing” by Winston Churchill looked at me, demanding to be bought. Which I did, for five bucks. Not THAT Churchill, you understand, though I didn’t know it at the time. This novel came out in 1904. The copy I now have was inscribed, in ink, to “Anna G. De Lin From Cora, 1905.” A Linda Leigh owned it later. I’m wondering whether Anna or Linda or anyone else managed to plow through its 595 pages. Whether they did or not, lots of others must have. Churchill’s “The Crossing” was a very successful book, I learned from Wikipedia. Someone penciled a hint in the front: “The American Churchill.” I had never heard of him, even though he was big success in his day. And Wikipedia explains why not. “In 1919, Churchill decided to stop writing and withdrew from public life. As a result … he was gradually forgotten by the public.” Then he died in 1947. What about Connelly’s “The Crossing” then? To what does the title refer? Not a bridge, as the dust cover misleads you to expect. No, in this tale of multiple murders and brilliant detecting, it’s the point where the paths of predator and prey first intersect. Glad to know there’s another Michael Connelly/Harry Bosch fan out there. I haven’t found a disappointing story yet in the series. As for Churchill, Man of the Century! What else need be said?